Continuing with the commentary theme of the Caro-Kann Exchange variation at the super-GM level, the below game is from the first round of Dortmund 2017, featuring Kramnik as White. He makes a non-standard choice of 6. Na3!? which leads to some unbalanced play and a clash of ideas in the middlegame. Black (Fedoseev) deliberately leaves his king in the center and weathers a White attack with some classic Caro-Kann themes, including the half-open e-file and sacrifice on e6. Black's cool nerves give him the victory in the end. I recently completed How Chessmasters Think by IM Paul Schmidt, who was a strong Estonian player in the Paul Keres era and subsequently emigrated to the United States. I ran across the book largely by accident a while ago and got it on Kindle, it being hard to find otherwise. It's rarely referred to in chess improvement literature, but the subject matter seemed to be very relevant. 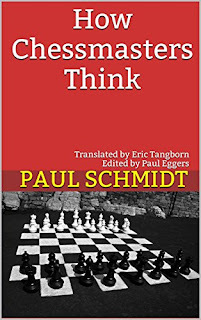 Rather than a tutorial on how chess players should think, the book is more of a descriptive exercise in how master-level players do think during a game, both on a theoretical and practical level. The author presents a series of annotated games, but rather than talking about the ideas or giving analysis in the usual method, instead writes annotations based on an imagined thinking process for each player. Essentially, he answers the question "why did the player choose this move" with a thought experiment for both sides of the board. Periodically he will also introduce an objective voice (the "critic") when critical moves are overlooked by both players. I found several advantages to the author's approach and learning benefits from the content. Some clear and valuable explanations of specific strategic considerations in main line openings, especially relatively early choices, which all too often are skipped over. Each of the chapters has a theme regarding chess situations and judgment which can be generalized, at least to some extent, in terms of facing similar future decisions. The games themselves are varied and high-quality, with frequent appearances by world-class players such as Keres, Alekhine, and Euwe, along with games involving Botvinnik, Fine and Capablanca. Some lesser master games are also included that are relevant and interesting, by people known to the author. The combination of strategic and tactical considerations as part of each side's "thought process" emphasize the practical aspect of thought, rather than pure strategy or tactics, as is often presented. A couple things were less helpful, from my perspective. A few move typos are scattered throughout the book, in both the game score and given variations. Most of the time it's clear what the move should be (for example Nc5 instead of Ne5), but in one or two spots it was really head-scratching. I expect this was due to the Kindle OCR conversion process. The author has the tendency to include 2-3 pages of variations of 8-10 moves and stream-of-consciousness thought in the early middlegame, which make it difficult to keep following the thread. He admits late in the book that most chess masters will calculate 3-4 moves ahead in non-forcing situations, but that it is necessary to go further when necessary. So the stream-of-consciousness over the length of a long variation sometimes comes across as a bit artificial. On the positive side, the moves then play out as part of the game, which makes it much easier to understand what is actually going on. While it's good to have to work things out for yourself, I found some annotations and explanations cut off a bit prematurely or were of the "...and wins" variety, when it wasn't immediately clear why it would win (eventually). The author seems to have been assuming an advanced (around master-level) audience in those cases. I would say that players around Class B and up would benefit from the book, which isn't terribly long (16 chapters / games). Today's commentary game naturally follows from the earlier Tata Steel 2019 Round 1 game. Van Foreest (on the White side of a Caro-Kann Exchange) lost the earlier struggle against Anand, but then became a winner on the Black side of the same opening. This game is quite different, though, as White's early choice to vary his development scheme sends Black down a more classical path, instead of Anand's setup featuring an open g-file and opposite-side castling.